Often, there’s a blast of attention for the opening of a Biennial, or Biennale, or Triennale. This happens partly because the media descends on a place for the first few days while opening events abound, and then go back on their merry ways. It’s also due in part to the event’s programming—how much of note actually happens after the initial weekend? The Chicago Architecture Biennial, now over a month on, is bucking that trend by doing a great job of extending its initial burst of programming. AN was able to check in on the Biennial and see some of the ongoing, publicly engaging talks, lectures, exhibitions, and performances. And there were plenty. 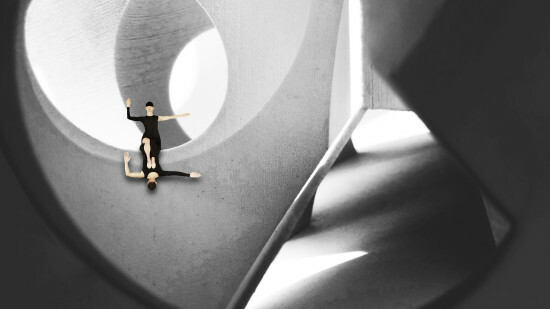 The trip started with a surreal performance by Jessica Lang Dance in collaboration with none other than New York architect Steven Holl. 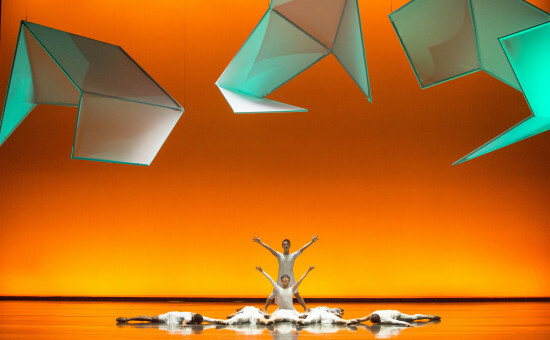 For 20 minutes at the Harris Theater on the northern edge of Millennium Park, Tesseracts of Time combined architecture and performance arguably the most potent way of all the Biennial’s performances, as nimble bodies gracefully moved around and through stage sets designed by Holl. The most engaging parts of the Biennial are not necessarily the ones in the Chicago Cultural Center. Periphery events have a considerable range of programming, from environmental issues and Chicago-centric ones, to global questions of infrastructural inequality. 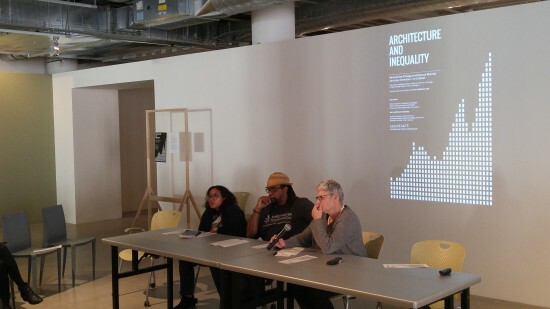 The latter was on tap Saturday at “Architecture and Inequality,” hosted by the history collective Aggregate. The six panels partly focused on extending the discussion from Aggregate’s special issue “Black Lives Matter,” which was a look at the structural challenges designers face when making cities and places for everyone. The discussions were surprisingly tailored to Chicago, and provocations from historians Meredith TenHoor, Sharon Haar, and Adrienne Brown were complemented by more contemporary presentations from Jonathan Massey and Emmanuel Pratt. TenHoor discussed infrastructure and inequality, using the unbuilt crosstown expressway in Chicago as an example of tangible inequality that galvanized a community—something that needs to happen today surrounding unequal urban spheres such as housing and transportation access. The panel was dynamic, illustrating the ways that architecture plays into uneven patterns of development and habitation in the city. At times, perhaps structural racism was over-conflated with economic inequality, but nonetheless the panels drew out the strong connections between the two. This is just one of many socially-minded panels that make the moralizing whiners sound silly when they complain that the biennial is not engaging with the city of Chicago and its unique urban problems. 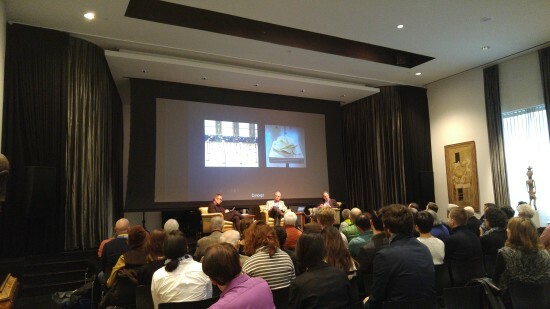 Switching gears very quickly, I headed to the standing-room only Chicago Arts Club to see legendary critic Bob Somol and his compadre Wiel Arets discuss with Geoff Goldberg the main exhibition of the Biennial. Somol is the former dean of the University of Illinois, Chicago, School of Architecture, while Arets is the dean of rival Illinois Institute of Technology. Goldberg is the son of Bertrand Goldberg. The three Chicago-marinated experts discussed the Biennial by choosing projects that caught their attention. Somol was especially taken in by Sou Fujimoto’s submission Everything is Architecture and Atelier Bow-wow’s Piranesi Circus. He compared Fujimoto’s installation to Hans Hollein’s Architecture is Everywhere. The Biennial’s strength is in its breadth and sprawl, but on Saturday it became a weakness. We couldn’t make it to a very intriguing event, “House Practices”, a discussion with Amanda Williams, Julia Sedlock, and Mejay Gula about their house-based practices. It took place far form the central loop, however, so I was not able to see it or the brilliant-looking exhibition also at the Elmhurst Art Museum, Lessons from Modernism: Environmental Design Strategies in Architecture 1925-1970.